The action of antimicrobial peptides (AMPs), ranging from direct killing of invading pathogens to immune response modulation and other complex biological responses, has stimulated research and clinical interest for more than two decades, but the area is still burgeoning due to emerging discoveries in the functions, roles, and regulation of AMPs, thus making the study of antimicrobial peptides a multi-disciplinary and rapidly evolving field. 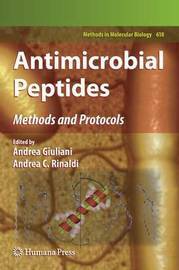 In Antimicrobial Peptides: Methods and Protocols, leading investigators present a broad, up-to-date collection of current research and experimental methods for the isolation, characterization, production, and optimization of antimicrobial peptides. Additional chapters detail methodologies in several microscopy techniques, high-throughput screening, QSAR modeling, and computer-aided design used to study these compounds, while key review articles survey potential medical applications of antimicrobial peptides as innovative anti-infective and immunomodulatory agents, as well as emerging discoveries in their function, regulation, and roles in innate immunity. As a volume in the highly successful Methods in Molecular Biology (TM) series, chapters include introductions to their respective topics, lists of the necessary materials and reagents, step-by-step, readily reproducible laboratory protocols, and notes on troubleshooting and avoiding known pitfalls. Authoritative and wide-ranging in its applications, Antimicrobial Peptides: Methods and Protocols provides both an authoritative guide for lab work on AMPs or related substances and a useful collection of thought stimuli to inspire further scientific endeavours in a wide array of vital fields. 18 Tables, black and white; XV, 424 p. 3 illus. in color.